This comprehensive kit gives the user the ability to deal with minor as well as major medical situations. 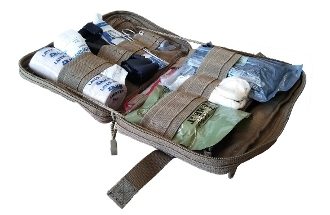 This kit provides the tools to deal with injuries related: to serious bleeding (including gunshot wounds), "sucking" chest wounds, tension pneumothorax, scrapes, abrasions, breaks/fractures, etc. The contents themselves are individually packed and sterile with instructions on the packaging. The items in this kit are currently in use with the US Military and are battlefield proven.